I once overheard a serious conversation between two curators as to whether the urinal they were looking at was a genuine Duchamp or an unauthorised urinal. Strange loops involve paradoxes that arise from the mixing up of subject and object. Strange loops endlessly change and yet endlessly return to the same point. 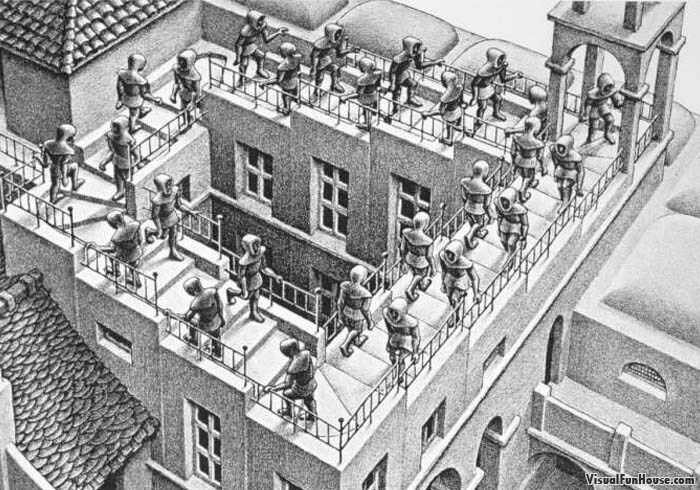 In this drawing of a strange loop, the ‘top’ of the stairs is also the ‘bottom’ of the stairs; it is the view point that endlessly oscillates up, down and around. Artist resale royalties [ARR] involve a lot of subject/object paradoxes. For the purposes of the ARR Act, “artist” becomes a special category of Australians requiring special treatment. At the very same time, in wider usage the terms “artist” and “art” have become so fractured and disparate as to mean nothing in particular. For example, Arts minister Simon Crean is reported as in favour of Ms Trainor and Mr James’s contentious proposal to abolish the strictly defined artform boards such as music and dance [and Visual art]of the Australia Council. Their proposal is based in a contemporary reality: distinct classifications of art (and non-art) are, these days, often an arbitrary and nonsensical basis for government policy. The ARR Act is a mandated, compulsory restriction of the terms under which some artworks can be sold. ARR imposes restrictions of terms of sale upon some makers of some art-like objects. These restrictions do not (and cannot) apply to many otherwise similar objects. As a classification basis for a restrictive law, restricted to a particular classification of Australians, “art” and “artist” are more arbitrary terms than “blue eyes”. Visual art these days does not need to be original, visible or an object in order to be classified as genuine visual art in an art museum. “Art” can be anything and therefore “art” and “artist” means nothing in particular. I walked out of official “art” years ago. The imposition by Law of a special class “artist” on me is annoying, anachronistic and a strange discrimination, apparently all for my own good. Who and what Artist Resale Royalties are really for, is definitely a strange loop. In every resale market that has been studied, art resales by value, are always concentrated in the top 20 artists. In the first years of the UK’s resale scheme, 49% by value of the total royalties collected were paid to just 20 artists. And the top 200 best-selling artists account for virtually all the total value of resales. Obviously any royalty on art resales must largely deliver benefits to the handful of artists most favored by the market, 70% of whom are dead artists. It is unbelievable that a very select group of a few hundred people, three-quarters of whom are dead, could have caused a government to pass an Act of Parliament for their benefit. Australia’s ARR scheme differs markedly from the European resale royalty schemes. Australia’s ARR allows artists a case-by-case right to not collect or, to make their own collection arrangement (Clauses 22 & 23 of the Act). The Act is not part of the Copyright Act: the Act is sui generis (copyright is always opt-in and usage is never compulsory). Australia’s scheme is administered by a professionally run agency, properly answerable to government. The tender for ARR was not awarded to the visual artist collection society that for years had lobbied for an EU version of a compulsory resale scheme. The Australian legislation and management are a real improvement on the lawless schemes exiting in a number of EU countries. However these same improvements give rise to another paradox: a lawful and properly run Resale Royalty Right is pointless. The EU schemes are in reality an amalgam of hypothecated tax and royalty rights. Given the opposite intentions and purposes of taxes paid to group and royalty rights of individuals, this EU amalgam is intrinsically an impossible mix: a chimera. In Europe, artist collection societies (and their closely associated peak arts representative organisations) are the largest single beneficiaries of ARR. Collective management is compulsory and therefore support of their collective costs is compulsory. Because these artist collection societies also collect money for an unknown number of artists, mostly dead, unknown or otherwise not contactable, the schemes generate significant revenues that can be redistributed by their twinned artist representative organisations. In parts of Europe there is a long tradition of taxes hypothecated to artist collection societies. Much of the confusion as to ‘who and what’ resale royalties are really for, comes from the conflating of the opposite intentions of individual economic rights and, duties paid to groups. Confusion of individual rights with duties to groups has been so long lasting and so widespread as to be evidence of intention. A limited distribution UNESCO Report of an Inter-Governmental Conference XII/6 Paris, 27 March 2001 reveals the thinking that underlies the EU resale royalties schemes. … droit de suite is not an instrument that would considerably improve the economic situation of a country’s artistic population. in Central European states with a tradition of collective representation not only in respect of the single author’s individual share, but also acknowledging the copyright’s cultural and social role, droit de suite definitely can be one of the different instruments for social or cultural support of the artists. The European authors’ societies maintain social and cultural support organisations also with droit de suite [resale royalty] remuneration. In the end their visual artists’ collection society did not win the tender for control of the Australian scheme. Rupert Myer in his Report of the Contemporary Visual Arts and Craft Inquiry of 2002 explicitly ruled out any hypothecated tax-like use of the resale royalty scheme (p.169). Without compulsory and redistributive payments to artist collection societies, resale royalties are simply a circular, phantom representation. How an undoubtedly well-intentioned government was led into adopting the misrepresentation of phantoms as the basis for policy and law-making will be the subject of our next post. The post implementation review has been completed and the Act has been given until June 2013 to actually comply with best practice for Australian law making.This means that this ‘sub-prime’ Act will have been operating for three years. During this period it has done real harm to Australian artists and the market within which they operate. Given the conceptual strangeness of the ARR, it would be surprising if it could ever meet normal standards for law-making in Australia. Our previous posts ‘with friends like this:’ part I here , part II here. This entry was posted in Art and Architecture, Uncategorized and tagged artist, resale, royalty. Bookmark the permalink.